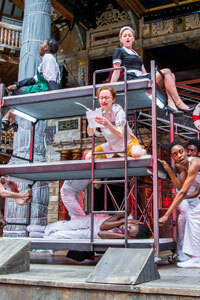 Emma Rice’s valedictory summer season at Shakespeare’s Globe started with a bang and is only getting louder. After Daniel Kramer’s raucous Romeo and Juliet, which got a lukewarm reception from the critics, comes Rice’s own Twelfth Night, her last main-house production of a troubled two years in charge. We all know the issues at stake by now – shared light vs sound and fury, austere reverence vs impish invention, original purpose vs new audience – and we all know on which side of the debate Rice and the Globe’s board position themselves. Rice was never going to capitulate to the purists here. 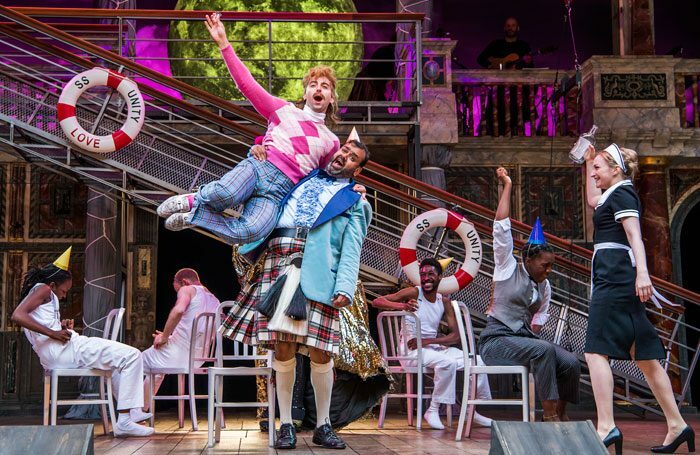 Her Twelfth Night reimagines Illyria as a remote Scottish island in the late ’70s, and makes Sebastian and Viola’s stricken ship a partying cruise-liner. It casts Katy Owen as Malvolio and Le Gateau Chocolat – a celebrated drag queen – as Feste. It revels in light, sound, song and dance, and relentlessly messes around with the text. It is, as one critic observes, “essence of Rice”. But does it float the critics’ boat, or leave them stranded in a sea of incomprehension? Does Rice sign off with a hectic Hebridean hooray, or a galling Gaelic goodbye? Does the Globe’s Summer of Love season belatedly burst into life or does a cloud of internal conflict still overshadow the South Bank? If review round-ups be the food of love, Fergus Morgan will play on. Kramer’s Romeo and Juliet earlier this summer presented audiences with a messy mash-up of cultural touchstones, ranging from Mexico’s Day Of The Dead festival to Village People’s YMCA to Breaking Bad to the Cuban Missile Crisis. What does Rice’s Twelfth Night offer up? “This production of Shakespeare’s great comedy is very much Twelfth Night — The Musical,” asserts Ann Treneman (Times, ★★). The eclecticism of Kramer’s Romeo and Juliet did not go down well with most critics, Dominic Cavendish labelling it “provocative and profoundly tedious” and Michael Billington lambasting “another example of vandalised Shakespeare”. What do the critics think of Rice’s irreverence here? But others simply revel in Rice’s inventive panache. “I watched much of the show with a broad smile on my face, both for its audacity and downright cheek,” Shenton admits, while Quentin Letts (Daily Mail, ★★★★★) hails “the most entertaining, exciting Twelfth Night for years”. “It’s entertaining, heartfelt, and extremely uplifting,” writes Debbie Gilpin (Broadway World, ★★★★★), and Rosemary Waugh (Exeunt) agrees. “It would take a cynic with a heart of granite to read this as a ‘f*** you’ to anyone, including Rice’s detractors,” she asserts. “Rice finds in Twelfth Night a brilliant reminder that, set against love and life, melancholy can be a little overrated,” concludes Sarah Crompton (The Observer, ★★★★), while Andrzej Lukowski (Time Out, ★★★★), recalling Rice’s A Midsummer Night’s Dream last year, thinks that “the collision of her expansive whimsy and Shakespeare’s wild, freeform comedy once again hits home with this joyous cuddle of a production”. The National Theatre’s well-reviewed Twelfth Night, which closed earlier this month, made headlines for casting a woman – Tamsin Greig – as Malvolio. Rice’s production follows suit, although, unlike Greig’s, Katy Owen’s Malvolio isn’t gender-flipped: it’s just a woman playing a man. And it’s received enthusiastically by most. 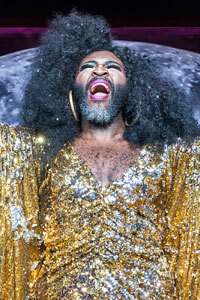 The other high-profile casting is that of cabaret artist and drag-queen Le Gateau Chocolat as Feste. According to Gilpin, the “insatiable” performer is “ingeniously cast” and according to Lukowski he’s “transcendentally fabulous”, but for Mountford, he “singularly fails to capture any of the character’s unique and melancholy wisdom”. And the rest of the cast? For Cavendish, they provide “a heap of fine performances”, for Taylor they “perform with terrific gusto”, and for Gilpin they are “incredibly well put together”. Twelfth Night – Is it any good? Rice hasn’t kowtowed to her critics, that’s for sure. Her Twelfth Night is as unabashedly untraditional as everything during her tenure as artistic director has been. It boasts an exuberant cast – blessed with a widely lauded performance from Katy Owen as Malvolio – and even some of Rice’s staunchest opponents admit that it generates mountains of feel-good energy. Five-star reviews from the Daily Mail and Broadway World contrast with two-stars from Michael Billington in the Guardian and Ann Treneman in The Times. The majority of critics slot themselves somewhere in between. Rice’s Twelfth Night is a lot of fun, most agree, but a lot of Shakespeare’s nuanced melancholy and his flirtation with gender-roles is lost along the way. What else were you expecting?